The world's most capable commercial Earth-imaging satellite will be launched into space Wednesday atop an Atlas rocket from Vandenberg Air Force Base in California. Liftoff is scheduled for 11:30 a.m. local time (2:30 p.m. EDT; 1830 GMT) at the opening of a 15-minute launch window from pad 3-East on South Base. "It's kind of like your kid going off to kindergarten and college for the first day at the same time," said Jeff Dierks, the program manager at satellite builder Ball Aerospace. "It's been something we've been working on for four years and it's coming to an end, but once they're launched we get to follow what they do for years and years. It's pretty cool." 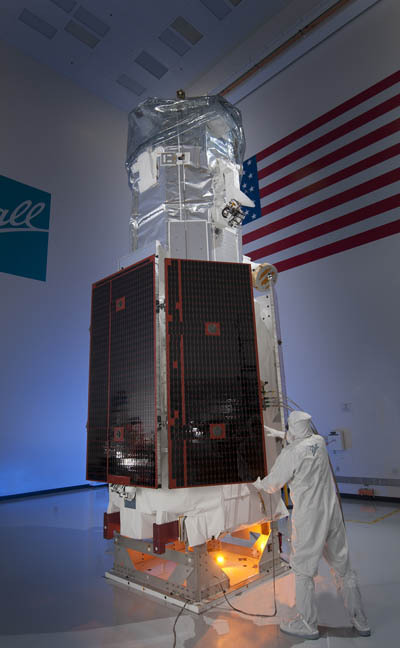 Designed to see objects as small as 1-foot-wide (31 cm) from 383 miles (617 km) in space, the WorldView 3 spacecraft will be the latest in a series of commercial eyes in the sky operated by DigitalGlobe of Longmont, Colorado. The market for imagery varies from the U.S. government to agriculture, oil and gas, scientific researchers and land developers. "As they are getting the licenses to get (better and better) resolution, that's really getting into the realm of aerial imagery from airplanes," Dierks said. But with the new resolution of WorldView 3 and the amount of imagery it can collect a day far outweighs imagery from planes. "They view it as a large market to move in to." 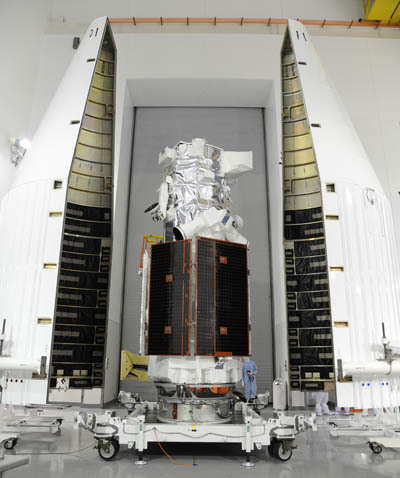 WorldView 3's capacity is 263,000 square miles (680,000 km2) per day. Built by Ball Aerospace & Technologies Corp., the 6,200-pound satellite stands 18.7 feet tall and 23 feet across with its power-generating solar panels deployed. 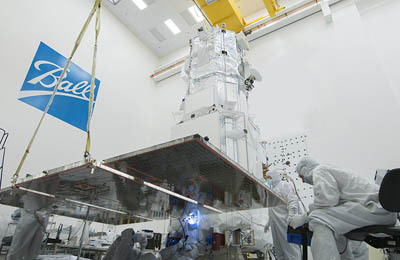 WorldView 3 carries an Exelis-built 1.1 meter aperture telescope. The craft has a design life of 7 years and expected service life of 10-12 years. "(Google Earth) is probably the use most people are familiar with. If you've looked up your house on Google Earth, the image taken from space on there was probably taken with one of the WorldView spacecraft," Dierks said. "Every time I see DigitalGlobe (logo) on the news, it makes me feel proud," said Dierks, who also led earlier spacecraft developments for the company. The satellite's sensors are part of the first multi-payload, super-spectral, high-resolution spacecraft in the commercial field. It can image in black and white and color, plus short-wave infrared to see through smoke and haze for disaster response and has an atmospheric sounder for enhanced color calibration. "Having that calibration helps them better, for example, ascertain crop health," Dierks said. "Is it really taking an image of the true color on the ground? Is that Ferrari we just took a picture of a true Ferrari Red or some other red?" WorldView 3 collects 31 cm panchromatic resolution, 1.24 m multispectral, 3.7 m short-wave infrared (SWIR) and 30 m Cloud, Aerosol, Water Vapor, Ice, Snow (CAVIS). Riding atop a 189-foot-tall Atlas 5 rocket, United Launch Alliance will deliver WorldView 3 into orbit under an arrangement with Lockheed Martin Commercial Launch Services. It is the 10th commercial Atlas 5 launch. A single firing of the Centaur upper stage will be needed to heave the payload into its sun-synchronous polar orbit. Deployment occurs 19 minutes after liftoff. The launch is the 630th for an Atlas vehicle, the 196th Atlas-Centaur, the 48th Atlas 5 rocket and the 24th to fly in the 401 configuration with a four-meter fairing, no solids and a single-engine Centaur. For United Launch Alliance, it is the company's 87th launch overall since 2006 and the 10th just this year.